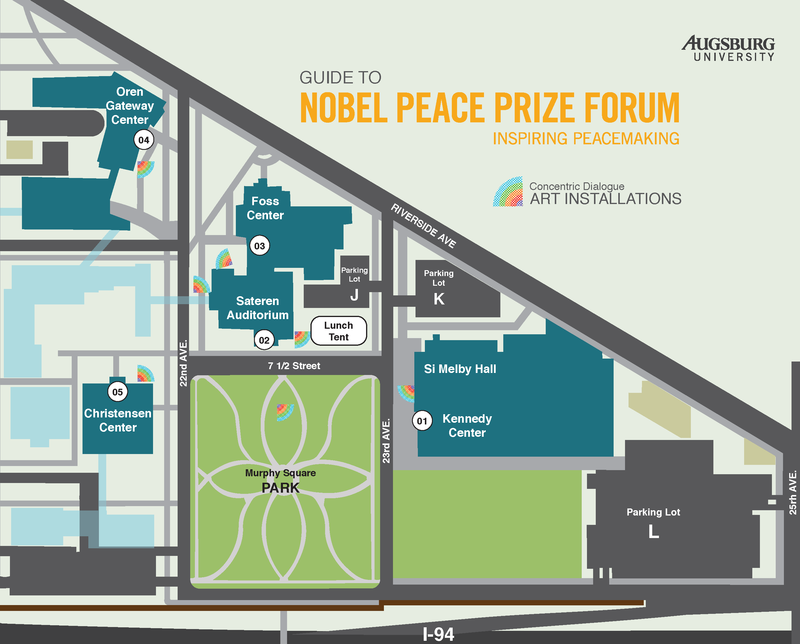 In the spirit of fostering dialogue and engagement during the Nobel Peace Prize Forum | Minneapolis, local and national artists have collaborated to create an outdoor exhibition of installations across the Augsburg University campus. These installations visually represent a form of dialogue and are connected by the Forum’s concentric circles. This work highlights the layered and often overlapping complexity of finding solutions to global issues; that small moments of inspiration can resonate through our actions; and that art may stand in the center of an ever-expanding understanding of our world. In “Future Light,” artist Asia Ward asks us to consider potential uses of sunlight under a canopy of dichroic film panels. “Common thread” by Background Stories provides an active, changing visual narrative created by the participants of this Forum. And young artists from Chicago’s National Youth Art Movement Against Gun Violence (NYAM) are not just seen and heard but in fact hold space on campus. They invite discussion through provocative large scale artwork, both physically and virtually. The Art Installations will be viewable throughout the Forum, at various installation points around Augsburg University campus. The capability to begin conversations on a challenging or complex subject is essential, but often times challenging to initiate. In an act of collaborative art and production provided by the Augsburg Art Department, attendees are invited to infinitely customize a variety of objects, including t-shirts and buttons, specifically designed to welcome dialogue. The Artmaking Workshop will take place all day on Friday, Sept. 15, in Murphy Square Park. The need for flexible, easy to install housing is growing in the wake of various crises in regions around the world. A group of architects from three continents have come together to design the Hex House, a prototype for low cost, sustainable housing in the face of these needs. The Hex House will be open for visitors to go inside throughout the Forum, in Murphy Square Park. Join us after Nobel Peace Prize Forum | Minneapolis sessions on Friday for a concert on celebrating peace and unity, featuring Cienaños and artists from Project Twenty Thirty. The Peace Concert will take place on Friday, Sept. 15 from 8:00-10:00pm, in the Foss Center Chapel. Silence is Health will be performed on Thursday, Sept. 14 at 8:00pm, and on Friday, Sept. 15 at 6:30pm, in the Foss Center’s Tjornhom-Nelson Theater. Blood Stripe depicts a Marine sergeant returning home after completing her third tour in Afghanistan. Unable to sleep, wracked by paranoia and anxiety, she carries unseen wounds. It is only a matter of time before she can no longer bottle up her trauma. When she has nowhere to turn, she runs far into the Boundary Waters of northern Minnesota. View trailer. This poignant movie about how war comes home is a must see. Director Remy Auberjonois and actress Kate Nowlin will participate during the Forum days and share their role as artists in the promotion of peace and social justice. Forum participants can purchase reduced general admission tickets. Please bring your name badges to the box office, or use the code NOBELSTRIPE when purchasing your tickets online. Blood Stripe will be shown on Friday, Sept. 15 at 7:15pm and 9:30pm, at St. Anthony Main Theatre. View full schedule.